Lockbox technology isn’t new—it’s been around since the 1950s. It’s a useful tool to help companies process payments, but it’s time to move lockbox processes and technology into the 21st century. and timely, and in fact, for many corporations and banks, they’ve been the foundation of Accounts Receivables (AR) operations and/or offerings. and corporations who want to run their own internal lockbox operations. a bank or a lockbox services provider, you’ll instantly become that much stickier with your customers. After all, you’ll no longer be just a bank or lockbox provider, you’ll be a valuable partner within their broader AR operations. That’s not the lockbox of the future. That’s what’s possible today. Ready to Rethink Your Lockbox Processing Operations? Whether you’re running an internal lockbox operation, outsourcing it to your bank or another third-party provider, or if you are a bank or third-party lockbox provider, it’s time to take a fresh look at the underlying platform powering your receivables processing operations. 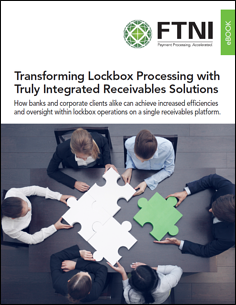 This new eBook will help you identify some of the key challenges legacy lockbox processing technologies are forcing banks, corporations and third-party lockbox vendors to address in a fast-evolving payments landscape and showcase how a truly integrated receivables platform will help you get a better grasp on not only your lockbox processing operations, but all accounts receivables operations across your entire enterprise—on a single platform.